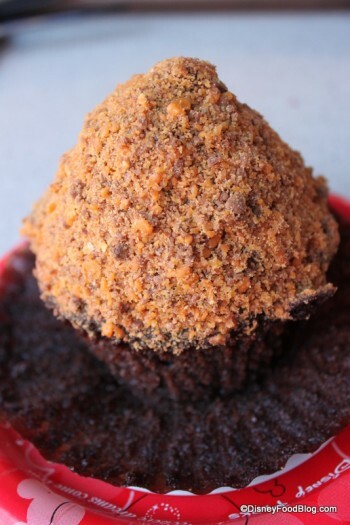 We found this amazing butterfinger cupcake waaaaaay back in early 2009, and at first, I wasn’t sure it was real! 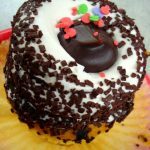 You can find it at what has become the holy grail of Disney cupcakes and all things yummy, Starring Rolls Cafe, in Disney’s Hollywood Studios. I decided (nearly three years later) that it was time to re-visit this treasure and see if it still garnered high marks as a snack (or breakfast ;-)) worthy cupcake. I’m all about in-depth research — especially where frosting is concerned! So what’s underneath that crushed butterfinger topping? Once you carve through the butterfinger topping, your first stop is that lard-y vanilla buttercream frosting — the perfect accompaniment for this particular baked good. I’m so glad they didn’t go with straight chocolate; the vanilla gives a lighter flavor and look to the cupcake while still delivering lots of texture. 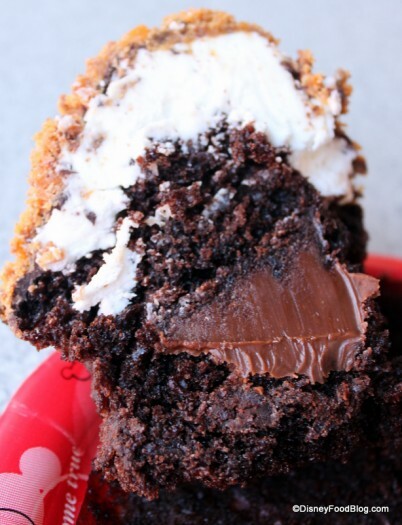 The chocolate cake here is one of the best when it comes to Disney cupcakes. I’ve never had it be dry, grainy, or tasteless as it can be at some other bakeries. And, of course, you get the surprise of the rich chocolate fudge frosting in the center of the cupcake! Sadly, no more butterfinger (would be fun to see pieces of butterfinger in that central frosting), but the chocolate punch is a great complement to the vanilla frosting on top. As always, this cupcake remains in my top tier list of favorites!! I’d love to hear about yours! 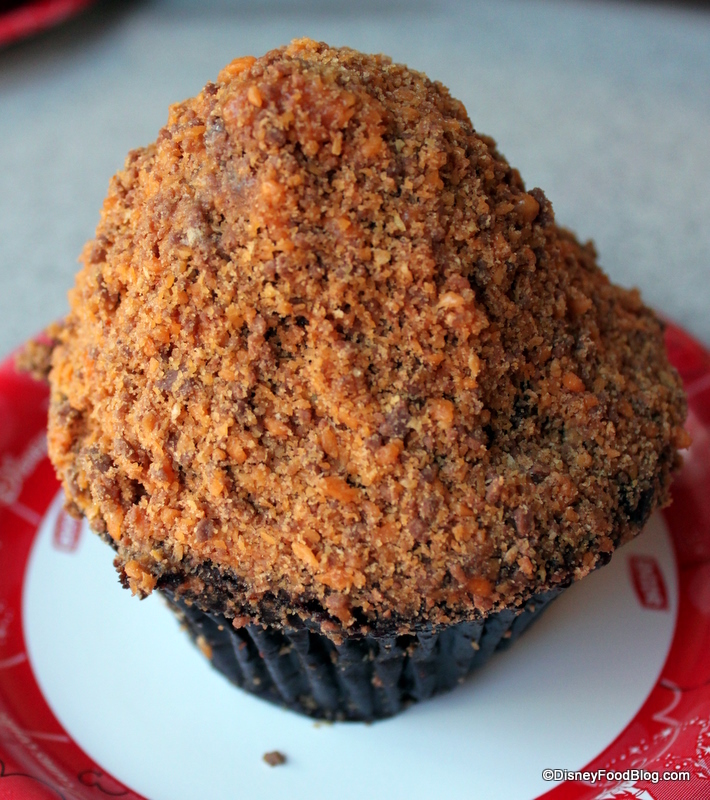 Have you tried the Butterfinger Cupcake? Let us know your thoughts — and your other favorite cupcakes in Disney parks! I love all your cupcake reviews so much and I can’t believe I didn’t have a single cupcake on my last trip to WDW in February! I’m going to have to fix that in September. If you had to pick ONLY one cupcake as your favorite which would it be?? Now I’m hungry, this one is at the top of my favorites as well as it’s butterfinger. The other one I enjoy is the paw print brownie at the AK. If I had to have one cupcake it would be the red velvet cream cheese cupcake at starring rolls, OMG so good! I’ll have you know, AJ, that you and all your cup-cakery science postings occupy pages 14-18 of my Big Binder Of Things To Try This Time. You are Good and Evil all at once. It’s a talent, I say. I definitely have to try this one out as well as the Red Velvet Cream Cheese Cupcake next time I’m in the Studios–and I’ll need to make sure I have some friends with me! I don’t think one person can manage those cupcake on their own. But they look amazing! This is my favorite cupcake, and I savor each visit to Starring Rolls. Last April we didn’t stop there until after 2pm, and much to my horror, they were closed. We checked at the candy store front next door, which shares a kitchen, to see if they had any cupcakes left. The girl at the counter said “Wait a minute, I think there’s still a chef here…” He custom made me a butter finger cupcake while I waited. Totally awesome. I was so excited to try it, after the first one I bought wasn’t to my taste, I thought maybe it was a bad batch, so I got it again. But no… It’s just too sweet for me. Ok, I’m not a cupcake girl but I love sweets. After seeing the close-up pictures I have to get some of these when I go in June. This looks fabulous!!! My favorite is still the chocolate peanut butter from Starring Rolls. My mouth waters just thinking about it. Mmmmmm cupcake…..
Oh no, I just drooled into my keyboard again. 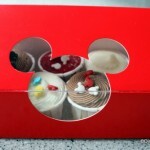 I’ve been to WDW 15Xs and I’ve never had any of their cupcakes! 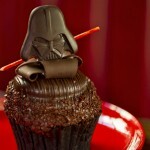 Because of finding this blog, cupcakes are on my ‘must do’ list for this year. I’m even planning ahead to provide a proper container to take some back home with me. How did I overlook them for so long? I’m not a huge cupcake girl, but man, that looks good! 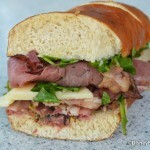 Can you get this as part of the dining plan as a snack credit? Without a doubt, I MISS the Mickey profile jelly filled donuts along with the glazed twists. Oh myyyyy they ware goooood!!!!! I agree that this is a wonderful treat and still holds up to this day. 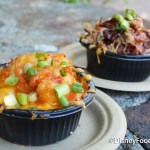 Is it any surprise the best snacks come from Disney’s Hollywood Studios? I’m partial to the red velvet cupcake, myself! Just way,way too sweet, I found. Like diabetic coma sweet.. Even by scraping off the butterfinger-encrusted buttercream frosting on the top, the cakey bottom is still filled with chocolate frosting.. I added little bits of the top part to my bites of the bottom. I felt a little ill after eating this, I must say.. It might have been alright if I wasn’t going to be doing any walking around after, but as it was it sat uncomfortably in my stomach even though I waited a good 10 minutes for my stomach to settle before pushing on with my wandering.. It would have been alright to take and eat while waiting for one of the live shows to start, for example. I think lots of milk to wash it down and dilute the sweetness would have helped as well (I had cappuccino with it, which wasn’t that good, and very stingy).. I should have gone with the banana split! Tried one of these last Sept. for the first time. The most disappointing part was the fact that these cupcakes stay in a refrigerated area so the cupcake is very cold and somewhat hard when you eat it. I prefer room temperature cupcakes so that the frosting and filling are soft and you can actually taste their true flavors. Overall it was good. Not too rich, but I certainly couldn’t finish it alone. It had more chocolate flavor than butterfinger flavor.